Drive starts with an important dedication. “To Donald Westlake, Ed McBain and Larry Block.” If an author is going to choose any three modern crime writers as inspiration for a book they could pick no better three than these dudes. Drive starts off with an opening sentence that could have been written by Richard Stark (a pen-name of Donald Westlake), proceeds to punch-out clean and clinical prose like McBain’s 87th Precinct novels and punches the story along like Lawrence Block at his best. 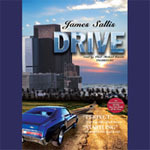 Drive stars “Driver”, a nameless Hollywood stunt driver by day and a criminal getaway driver by night. We get how he started in the business of stunt-driving, a few scenes of him pulling off those incredible feats of automotive control, and how he got involved in the punishing business of criminal getaway driving. It’s fast, but it ain’t furious, it’s more of a simmering sizzle. Blackstone narrator Paul Michael Garcia, who I last heard as the reader of Starman Jones, has a young voice – I knew I’d enjoy his reading of something in this genre. Garcia’s narration made it an incredibly solid listen. What’ll keep it from being a classic of the niche is that same anonymity of the protagonist. I enjoyed the ride with the guy, the “driver”, he has an incredible story to tell, but it was like I got hypnotized by the road somehow – I got to the end, refreshed and exhilarated but not particularly aware of what route we took. Perhaps this makes Drive the ideal summertime, top down, high-gear audiobook? It’s a novella so it’s short and you’ll zip through it practically before the commute is over. I think its worth giving a try.